Samsung Teasing a Buy Of SmartThings, Is It a Smart Buy? Samsung is trying to get into the Home Automation business the old fashion way, by buying their way in. This is a very different strategy than Samsung has used in other consumer markets, preferring in the past to carpet bomb consumers with a mix of marketing and blitz of products until there is only mindshare and market share left for Samsung and one or two other competitors (Smartphones anyone?). Question is, if you were Samsung and your two biggest frienemies, Apple and Google, had both laid out their Home Automation Strategy, Google with the Acquisition of Nest, Dropcam, and the establishment of a Home Automation Venture Fund, and Apple with HomeKit, a platform included in iOS 8 that is meant to bring IoT device manufacturers deep into Apple’s walled garden, what would you do? Samsung, who successfully competes against both Google and Apple, could have entered the market consistent with their historical strategies and picked a niche to initially own, then drowned the segment with products and services until consumers give up and swallow the view of Home Automation Samsung is selling. With proven prowess in more diverse devices than Apple (iFridge anyone) and a slightly schizophrenic software strategy (TouchWiz anyone? ), a Home Automation software platform might have made more sense. Instead Samsung chose to target SmartThings, a good firm to be sure, but it’s no Nest or DropCam. 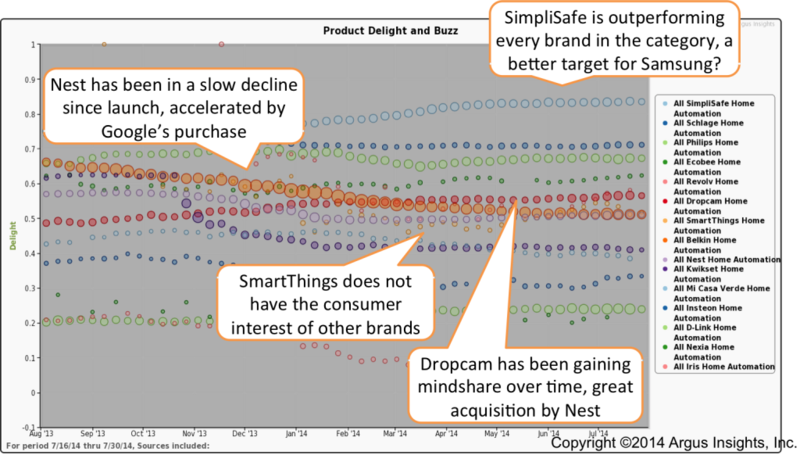 In fact, of the major Home Automation Brands, SmartThings is not one of the leaders and lags behind SimpliSafe, DropCam, Schlage and others. It may seem a bargain to Samsung at $200 million but much more will have to be invested to command the market position already held by DropCam and SimpliSafe. Consumer interest in SmartThings is increasing but not enough to justify a Samsung acquisition. Other companies are doing more to move consumers into the IoT ecosystem. In fact, SimpliSafe would have been the better acquisition target. Already a clear leader in the segment, this hero of DIY home security consumers has established a significant and growing beachhead in homes, from which they can simply (couldn’t resist) expand their capabilities for Home Automation, similar to the recent move by DropCam to include object trackers to help find your keys. Samsung Home Automation strategy needs a strong software component to craft a user experience that consumers will choose of both the upstarts and juggernauts already winning in the market. We are tracking the front lines of Home Automation and IoT across multiple social channels. This allows Argus Insights to separate the brand promise from the product reality, identify emerging leaders, and assess the growth prospects for the market overall. Drop us a line or give us a shout if we can help you make sense of how the actual consumers, not the pundits, are shaping Home Automation and IoT for their own needs.